Earlier this year, the Esri Canada Centre of Excellence (ECCE) App Challenge was won by UW Team SDS for their transit and routing app PredictION. 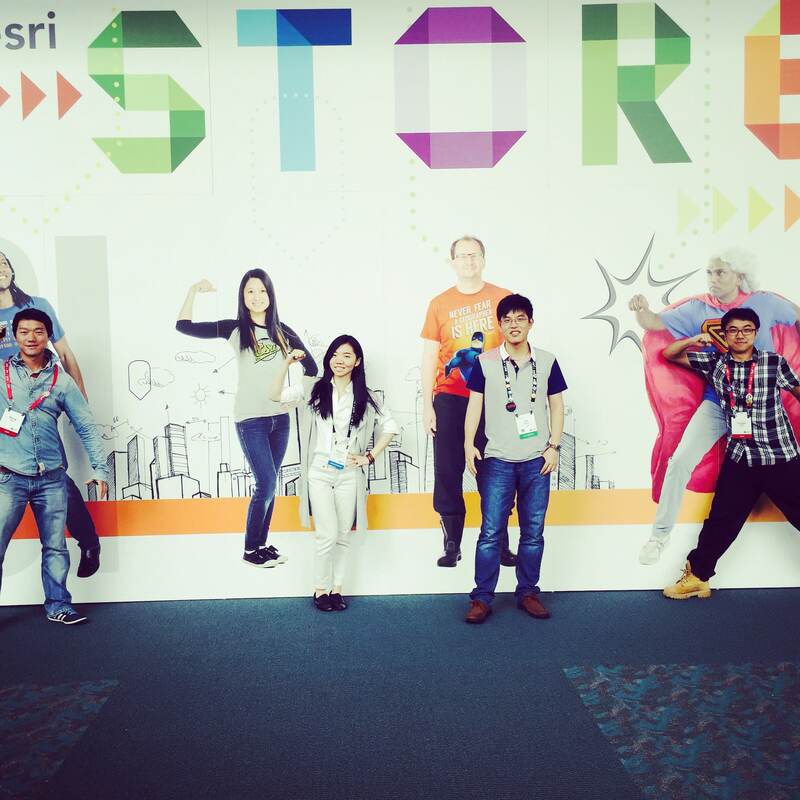 The team’s prize included a trip to San Diego for the Esri International User Conference. Ashley Zhang, who was a member of UW Team SDS, details some of the more interesting and memorable moments from her trip to the conference. Attending the Esri International User Conference (UC) was definitely one of the most memorable experiences of my GIS career – not only because I was excited to see and meet some of the big names in GIS that I have heard of since my first day as a GIS student, but also, and more importantly, because it made me realize how GIS technology has become much more intuitive and user-friendly for people with or without a background in GIS. Ashley (second from left) posing with several new friends she met at the Esri UC. The first thing I noticed upon arriving at the Esri UC was just how big it was. The first day of the conference, I was amazed by how many people were packed into the convention centre. I was told that the Esri UC was about half the size ten years ago, but now, more than 15,000 people from all over the world attend the conference every year. I think such an increase in attendance not only signifies the growth of Esri as a company, but also reflects the rapid development of the entire GIS industry. More people outside of the GIS field are now applying GIS technologies in their own domains. During the keynote presentations, I saw many different applications of GIS in various areas such as government, public health, environmental protection, and airport management, and learned of experiences from Esri users from diverse fields including education, agriculture, and forestry. From my perspective, the increasing accessibility and usability of GIS technology is an important impetus to the prevalence of GIS applications. During the ECCE App Challenge, our team used the Web AppBuilder for ArcGIS to build PredictION, our Web application. Using this tool, we were able to prototype and develop a Web interface quickly with GIS functionality. 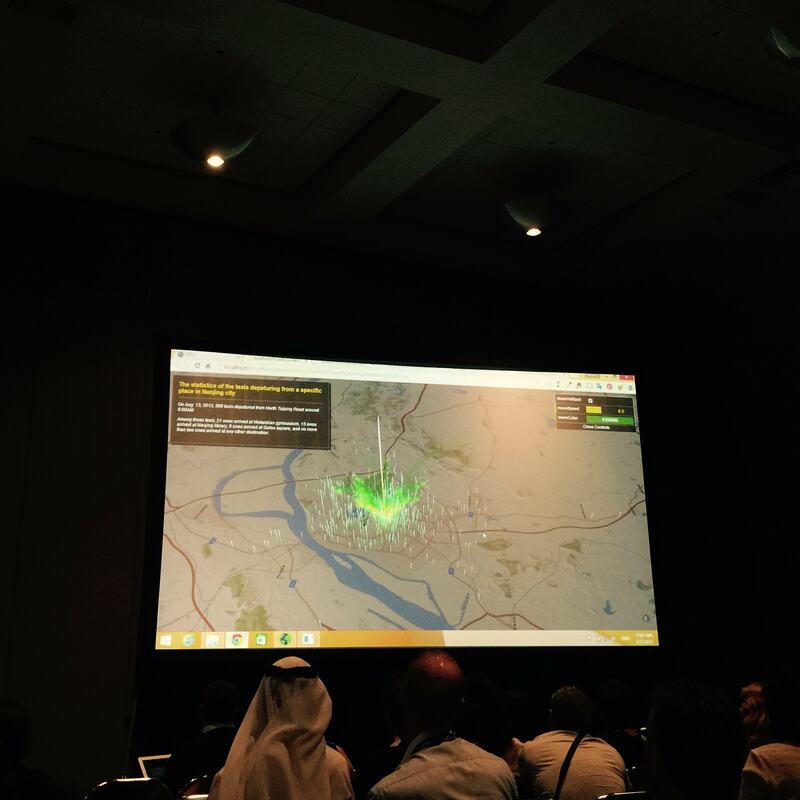 During the conference, I was able to see other Esri products that also put a strong emphasis on being user-friendly. For example, AppStudio for ArcGIS and the ArcGIS Runtime SDKs allow users to build mobile and 3D applications without relying heavily on programming skills. Collector for ArcGIS and Survey123 for ArcGIS are two other examples of GIS apps where users can quickly set up their own map-based or form-based templates to collect geospatial data. Moreover, being able to integrate ArcGIS with other platforms such as R and Microsoft Office helps facilitate access to geospatial technologies for broader communities. When Dr. Michael Goodchild first discussed the idea of Volunteered Geographic Information (VGI) in 2007, he suggested that anyone could be a producer of geospatial data. We might also be able to foresee a forthcoming era when anyone can become a ‘geospatial analyst’. In addition to the excitement of the developments in Esri technology, I also enjoyed meeting new people during the Esri UC. Talking to people in the different roles of GIS industry – staff from the Esri Research and Development Centre, developer interns at Esri, and Esri clients – exposed me to different perspectives on the technology and the field. It was also a great pleasure to meet the Esri Canada group – everyone was very kind and open to share their experiences and thoughts. Overall, I had a great experience attending the Esri UC in San Diego. I would like to attend the conference again and get involved with other Esri conferences/events in the future.